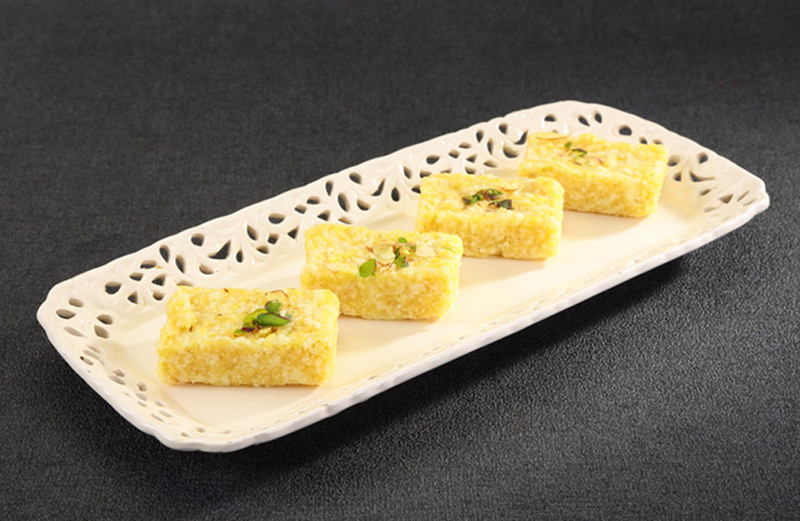 Milk cake recipe is a most delicious Indian dessert dish, which is prepared with milk and sugar. This sweet recipe is made on special occasions such as festivals and Diwali, Holi, etc. This authentic Indian dessert dish is absolutely happy for taste buds and.Milk Cake recipe is quite simple to prepare at home but most difficult part is it has take lot of time to cook.It will take around 90 minutes.Depending on quantity of milk.The best thing about preparing this sweet dish at home is that you can keep an eye on the quality of the material used in it and if you want to make this dish more richy texture, add the powder green cardamom, this sweet pleasure will become more fragrant.Milk Cake is a topped with crispy pistachios and flavored green cardamom. So, try this recipe at home during this festival season and try this delicious recipe which is not only graceful, but it is very easy. You can also pack it for picnic and road trips. We are sure that your children will love this sweet happiness.Let's checkout recipe first. Step 1 : To make Milk Cakes first, add milk in a heavy bottom karahi or pan, keep it warm, cook the milk on high flame first. Keep milk running when the milk starts boiling (It is most important to run continuously otherwise the milk can be sticking in the bottom of the Karahi). Step 2 : Cook Milk continuously until 1/3 of all milk is left. When the milk is 1/3 left, slow the flame. Step 4 : After few minutes, stirring the milk continuously and cook until it is thickened, keep the gas slow down now, when the milk is thick and granular, put sugar in it and cook it continuously.The milk has to be cooked up to consolidation. Step 5 : When milk is well-formed, its color also becomes light brown. Good smelling also comes. Our mix is ​​ready, slow down the gas and keep it running continuously. Now add cardamom powder and mix it well. Step 6 : Take a pan and grease it with ghee. The mixture has been cooked in the consistency , turn off the gas and put the mixture in the bowl and keep it covered with towel or clothe so that the mixture is properly set. Step 7 : Keep milk cakes to freeze, in about 24 hours it becomes frozen. To remove the milk cake from the pan first, separate it from the edges with the knife, and then give the light 5-6 second heat on the gas so that it leaves the bottom of pan easily. Now flip pan on top of the plate and patting it on top of the vessel, remove milk cake. Finally : Milk cakes are prepared well. Cut it into your favorite shape. Milk cake is darker than inside because when we mix milk cake, it is very hot and is still cooking from inside. Because of this, his color becomes darker in the dark. Made of delicious Milk cake is ready.